Even if we consider only mean reversion subset of pairs trading (yes, there are more), there is still multiple ways of how to do it, which differ mostly in math behind generating entry and exit signals. We refer to the mean reversion stategy details (the math and logic in signal generation) as to a model. Is it better to trade intraday (during the whole day) or just at the end of the day (EOD)? You can decide if you will handle entry/exit signals during the whole trading day (intraday trading) or if you restrict trading session to some short trading interval to imitate EOD (end-of-day) trading. There are advantages / disadvantages to both approaches. There are also hybrid setups possible (for instance, entering positions EOD but closing intraday or vice versa). How risk control is handled in pairs trading? Using traditional loss % based stop-losses is tricky and not very effective here, because strategies are composed from multiple legs and positions are commonly held over nights and weekends. One cannot control risk properly using just stop orders when dealing with positions like these due to price gaps which are very common in setups like this. The better approach is just to divide the margin used into many "small" pairs strategies to avoid putting "all the eggs into the same basket". This is the reason we do not implement traditional stop-losses. Which instruments can I use for testing? You can use all US stocks, ETFs and in addition any instrument available at Google Finance as long as history data (via the Download to spreadsheet link!) is available. Use same stock codes as on Google Finance, including the exchange prefix. Which models can I use for testing? What data is used for analyses, backtests, studies and pre-screened database? In September 2013 we introduced the data^HQ system for US stock market data. How does it work? We aggregate financial and corporate event data from multiple data providers and we try to automate the data correction process based on multiple data streams. We focus on correcting unadjusted data issues with splits and reverse splits, which cause most problems for our algorithms. There are more details about the data^HQ system in this forum thread. Remark: data^HQ is used only for US stocks and ETFs. For other markets, or in case data^HQ is not available, Google Finance data are used as a fallback. Using of data^HQ is indicated in backtest/study result by this HQ sign. Is this data adjusted for splits and dividends? Data provided by data^HQ system (all US equities) is adjusted for all capital-related corporate actions - splits, reverse splits, capital returns, special dividends, stock dividends, demergers and spin-offs. Data is not adjusted for ordinary divindends as this would not be correct. Data provided by Google Finance is adjusted for splits, reverse splits, demergers and spin-offs. For more info about how Google Finance data is adjusted, please consults Google's financial data specifications. 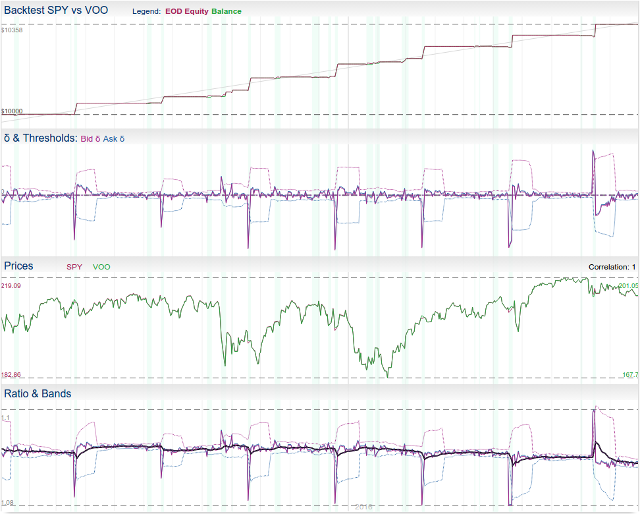 What are features and limitations of the online backtesting engine? The backtester powering this website is a quite simple engine running on end-of-day close prices. Close prices only are used to calculate model statistics and to generate trade signals. My backtests show results “too good to be true” with “Warning: This backtest may indicate inflated performance due to consolidated prices noise!”. What does this mean? Pair Trading Lab calculates backtests and analyses using consolidated, end-of-day prices. This is fine for many strategies, but unfortunately with mean-reversion strategies over US-based equity baskets (like pairs trading) it introduces a problem in certain situations. Why? The issue appears if equities are listed on a primary exchange (like NASDAQ), but in addition they are being traded at multiple secondary venues at the same time (like BATS, ...) while prices being consolidated over all these venues. The problem is then that if you have two equities (AAA and BBB), it is not guaranteed that close prices you get are from the same venue and same moment. This creates additional "virtual" noise in close prices, which is not too significant for most of pairs, but for pairs like VXX/VIXY, UVXY/TVIX and others, which have correlation over 0.99 and very low standard deviation of their ratio/spread, it inflates backtest result so much that it cannot be really trusted for these particular pairs. This is why you get the warning. You must understand that these pairs are intensively traded by HFT traders doing statistical arbitrages in market microstructure and they won't allow you to profit in real. To confirm that your strategy works on pairs like this you would have to backtest preferably using tick data, or at least with quality intraday data. Backtesting using non-consolidated (official primary exchange) EOD prices should also help, but these data are really difficult to get. As a part of your education, it is good idea to try to run these strategies like UVXY/TVIX in PTL Trader using paper account. You will see for yourself how these pairs really behave in real-time. You will notice there is quite significant difference between z-score ASK and z-score BID, even that bid-ask spread on both legs is $0.01, which is already suspicious. You will not get virtually any entry signals, because the noise in consolidated prices is inflated and entry signals will be mostly not met. You might also notice that if quotes change for UVXY, TVIX quotes will match the change in milliseconds, which is probably HFT traders conducting their stat arb market making. How reliable are backtest results considering ordinary dividends are not simulated? When you trade pair strategy, you gain dividends for the long leg and you pay dividends for the short one. So the impact of dividends can be expressed like D = Dgained - Dpaid. Under most conditions, the D is very close to zero (if both legs have similar dividend gaining performance). In 99% of pairs, the impact of gaining and paying dividends is significantly lower than your profit or even comissions paid. However, there are some examples where this is not true. Good example is the SPY/VOO pair. This pair exhibits extremely positive correlation (close to 1) - it is too correlated so there is no space left for any profits. You can see the backtest is suspicious at the first sight - trade signals are only triggered on ex-dividend dates (you can see the peaks). Please mind this when you select your pairs - avoid pairs with extreme correlations with periodical peaks in the Z-Score and equity too nice to be true. Usually these pairs exhibit very low CAGR but very good looking equities and profit distributions. We will fully support simulating dividends in the future. For now please stay aware of this limitation. I have pair AAA/BBB in my portfolio. I would like to add pair AAA/CCC, but it won't let me. You can't have two pairs sharing the same equity in the same portfolio. This is not the limitation of the software solution. The problem is that IB (as an US broker following US regulations) does not (and must not) support hedged positions (you cannot hold long and short position of the same equity at the same time within one single account). So imagine you are in long pair position of AAA/BBB pair (long AAA, short BBB). Now your AAA/CCC pair would like to go short (short AAA, long BBB). Entering this position would reduce the current position in AAA held by the AAA/BBB strategy. This is the reason why you cannot share equities within the same portfolio. There is nothing to do about it. It is always less or equal to CAGR in absolute value. For systems with perfect linear equity (linearity=1) it is equal to CAGR (positive or negative). For systems with "ugly", non-linear equity full of drawdowns, it is close to zero. Traders prefer systems with System Score as high as possible (this guarantees system with both high yield and nice profit distribution at the same time). I noticed that my recent pair tests are announced in Recent Analyses and Recent Backtests. I would really prefer to keep my pairs from being disclosed to public. This is no longer true if you become a Premium Member. All pairs, backtests, studies, portfolios of Premium Members are treated as 100% private. Something is wrong with my PTL Trader instance. How should I report the issue and what should I include? In order to report any issue with PTL Trader, please create a ticket in Helpdesk. You need to register first. Please do not use e-mail to report issues. 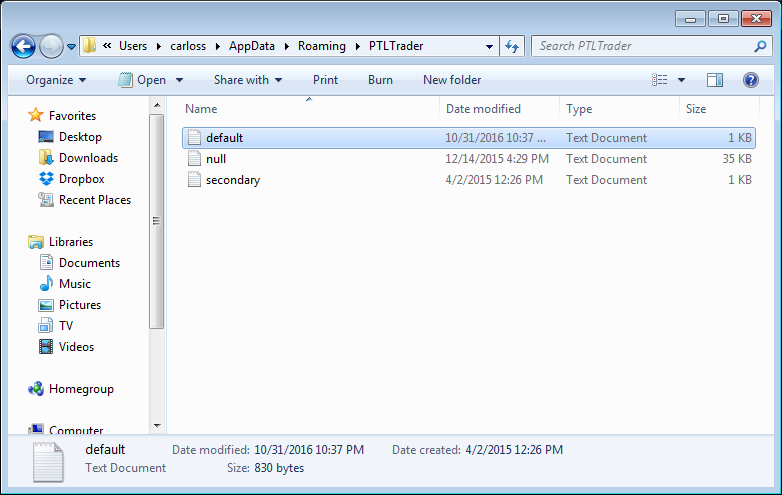 Where do I find PTL Trader log files? Log files are named according to your PTL Trader instance name. For the primary instance it is default.log. Under Windows you may need to enable displaying hidden files and folders to access the AppData folder. My PTL Trader does not start under Linux or macOS or it does not behave correctly. What should I do? Linux and macOS versions of PTL Trader are provided as-they-are, with no support whatsoever. Please use the forum to get community support for your issue. What market data subscriptions do I need to trade US equities? Useful info: Interactive Brokers' Market Data Documentation. Does PTL Trader support portfolio margin? PTL Trader does support portfolio margin, but you must setup the margin requirement for each leg correctly and manually. Does PTL Trader support Contracts for Difference (CFDs)? How can I trade CFDs? Since PTL Trader v1.5.0, our clients may trade pairs based on Contract for Difference (CFD) instruments. The main advantage is lower margin requirements (it permits them to trade more strategies on their accounts). Please read about IB CFDs here: IB CFDs Overview & FAQ, IB CFD Interests, IB CFD Commissions, IB CFD Margin Requirements and make sure you understand everything. Unfortunately CFDs are not available for trading to residents of US, Canada, Hong Kong, Australia, New Zealand and Israel. Additional limitations apply for residents of Japan and Singapore. These limitations are enforced by regulations Interactive Brokers has to follow, do not ask us anything related to these limitations, we won't be able to help you! use the extra leverage gained from using CFDs to trade more strategies at the same time rather than boosting the leverage for the average portfolio; if you dedicate your whole account to pairs trading using 10% margin CFDs only (leverage 1:10 per leg), trade at least 50 pair strategies in your portfolio in order to diversify! I would like to trade pairs based on non-US equities. Unfortunately for now PTL Trader only supports US equities denominated in USD only. In future we will lift this limitation. My account is set up to have different base currency than USD. PTL Trader refuses to work. Unfortunately for now PTL Trader only supports USD as the base currency. In the future we will lift this limitation. There are no positions indicated in PTL Trader (I am sure there are some). Positions in the Pair Legs tab are displayed per strategy. So you need to click on any strategy first to see positions related to it. How should I setup my strategy so it trades at the end-of-the-day only? Setting up a strategy to trade at the end of the day only means to restrict the time the strategy is allowed to trade. For instance, set the trade hours for the strategy to something like 15:50 - 15:59 to trade last 9 minutes of the trading session. It is good to leave one minute after the interval to slow fills in order to avoid you positions not being completely filled before trade session stops (like in the example). What execution algos does PTL Trader offer? How much can I trade without moving the market? PTL Trader only supports simple market order executions at this moment. We plan to support more sophisticated algos in the near future. Market orders are still sufficient for trading accounts of hundreds of thousands USD as long you trade liquid equities only. If this is not enough for you and you really would need better execution algos right now, we can help you by providing advanced execution solution from our partner (contact us in case of such interest). PTL Trader is stuck in “entry: waiting for hist data” state and my log file is full of errors. You need to purchase market data subscriptions (from Interactive Brokers). PTL Trader is indicating Z-Score above the entry threshold but it won't enter the position! PTL Trader is not indicating equity availability for shorting correctly (stocks are indicated as easy-to-borrow in TWS, but hard-to-borrow in PTL Trader). There is a known bug in IB API causing this. Please restart both TWS (or IB Gateway) and PTL Trader to fix it. As a workaround, whenever do you need to restart either TWS/ IB Gateway or PTL Trader, always restart both of them. PTL Trader is indicating incorrect bid-ask data for equities and therefore calculating Z-Score incorrectly. PTL Trader is calculating Z-Score wrong! I calculated it myself using my algorithm and data and it is completely different! Please check bid-ask quotes coming from IB and IB historical prices against another sources (like Google Finance) to see if there is any discrepancy. The issue with historical data often happens after split or reverse split (where IB forgets to make the adjustment in their historical data in time). To check the historical data used for model calculations, you can check PTL Trader log file (it lists last 15 prices for each symbol). If you confirm there is a problem in IB data, please contact IB support and report the issue. I have setup monitoring of my PTL Trader instance, but I keep getting many warnings of my instance not responding, but I am sure it works fine. What is wrong? Please make sure your VPS system time and timezone are both correct.